For two years we’ve debated different drafts and versions of the controversial Articles 11 and 13. Now, there is no more ambiguity: This law will fundamentally change the internet as we know it — if it is adopted in the upcoming final vote. But we can still prevent that! Commercial sites and apps where users can post material must make “best efforts” to preemptively buy licences for anything that users may possibly upload — that is: all copyrighted content in the world. An impossible feat. The final version of this extra copyright for news sites closely resembles the version that already failed in Germany — only this time not limited to search engines and news aggregators, meaning it will do damage to a lot more websites. Reproducing more than “single words or very short extracts” of news stories will require a licence. That will likely cover many of the snippets commonly shown alongside links today in order to give you an idea of what they lead to. We will have to wait and see how courts interpret what “very short” means in practice — until then, hyperlinking (with snippets) will be mired in legal uncertainty. Authors’ rights: The Parliament’s proposal that authors should have a right to proportionate remuneration has been severely watered down: Total buy-out contracts will continue to be the norm. In the relentless pursuit of this goal , concerns by independent academics , fundamental rights defenders , independent publishers , startups and many others were ignored. At times, confusion was spread about crystal-clear contrary evidence . Parliament negotiator Axel Voss defamed the unprecedented protest of millions of internet users as ” built on lies “. In the end, a closed-door horse trade between France and Germany was enough to outweigh the objections… so far. What’s important to note, though: It’s not “the EU” in general that is to blame — but those who put special interests above fundamental rights who currently hold considerable power. You can change that at the polls! The anti-EU far right is trying to seize this opportunity to promote their narrow-minded nationalist agenda — when in fact without the persistent support of the far-right ENF Group (dominated by the Rassemblement/Front National ) the law could have been stopped in the crucial Legal Affairs Committee and in general would not be as extreme as it is today. The Parliament’s process starts with the approval by the Legal Affairs Committee — which is likely to be given on Monday, February 18. Our best bet: The final vote in the plenary of the European Parliament , when all 751 MEPs, directly elected to represent the people, have a vote. This will take place either between March 25 and 28, on April 4 or between April 15 and 18. We’ve already demonstrated last July that a majority against a bad copyright proposal is achievable . The plenary can vote to kill the bill — or to make changes , like removing Articles 11 and 13. In the latter case, it’s up to the Council to decide whether to accept these changes (the Directive then becomes law without these articles) or to shelve the project until after the EU elections in May, which will reshuffle all the cards. It is up to you to make clear to your representatives: Their vote on whether to break the internet with Articles 11 and 13 will make or break your vote in the EU elections. Be insistent — but please always stay polite. 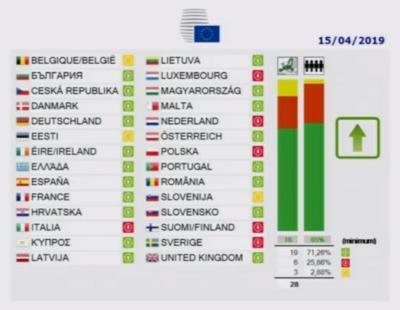 While Italy, Poland, the Netherlands, Sweden, Finland and Luxembourg maintained their opposition to the text and were newly joined by Malta and Slovakia, Germany’s support of the “compromise” secretly negotiated with France over the last weeks has broken the previous deadlock . This new Council position is actually more extreme than previous versions, requiring all platforms older than 3 years to automatically censor all their users’ uploads, and putting unreasonable burdens even on the newest companies. The German Conservative–Social Democrat government is now in blatant violation of its own coalition agreement , which rejects upload filters against copyright infringement as disproportionate. This breach of coalition promises will not go down well with many young voters just ahead of the European elections in May. Meanwhile, prominent members of both German government parties have joined the protests against upload filters. Right before the European elections, your voices cannot be ignored! Join the over 4.6 million signatories to the largest European petition ever and tell your representatives: If you break the Internet and accept Article 13, we won’t reelect you! On top of that, even the smallest and newest platforms, which do meet all three criteria , must still demonstrate they have undertaken ” best efforts ” to obtain licenses from rightholders such as record labels, book publishers and stock photo databases for anything their users might possibly upload — an impossible task . In practice, all sites and apps where users may upload material will likely be forced to accept any license a rightholder offers them , no matter how bad the terms, and no matter whether the y actually want their copyrighted material to be available on the platform or not , to avoid the massive legal risk of coming in conflict with Article 13. In summary: France’s and Germany’s compromise on Article 13 still calls for nearly everything we post or share online to require prior permission by “censorship machines” , algorithms that are fundamentally unable to distinguish between copyright infringement and legal works such as parody and critique. It would change the web from a place where we can all freely express ourselves into one where big corporate rightholders are the gatekeepers of what can and can’t be published. It would allow these rightholders to bully any for-profit site or app that includes an upload function. European innovation on the web would be discouraged by the new costs and legal risks for startups — even if they only apply when platforms become successful, or turn 3 years old. Foreign sites and apps would be incentivised to just geoblock all EU users to be on the safe side. MEPs, most of whom are fighting for re-election, will get one final say. Last September, a narrow majority for Article 13 could only be found in the Parliament after a small business exception was included that was much stronger than the foul deal France and Germany are now proposing — but I don’t have high hopes that Parliament negotiator Axel Voss will insist on this point. 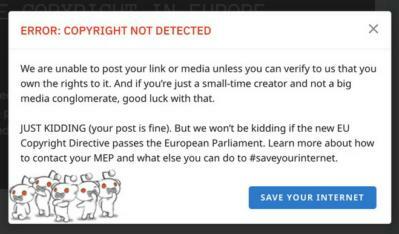 Whether MEPs will reject this harmful version of Article 13 (like they initially did last July) or bow to the pressure will depend on whether all of us make clear to them: If you break the internet and enact Article 13, we won’t re-elect you.